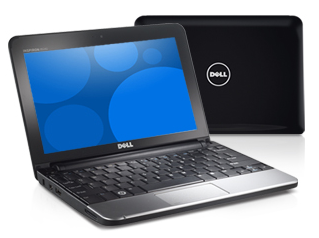 Dell is now offering a 10in netbook for a pound under 200 quid. The Inspiron Mini 10v lacks the internet tablet-oriented Intel Atom Z-series processor of the existing Mini 10, replacing it with the Atom N270. To get the price down under 200 quid, Dell has dropped the 10's 160GB hard drive for an 8GB SSD, replace the 1024 x 600 display with a 1024 x 576 model, and pre-loaded the mini laptop with Linux: Ubuntu 8.04, to be precise. If you'd rather have XP, you can select the next model up. It's priced at £279 and includes a 160GB HDD. The base Mini 10 comes in at £299.